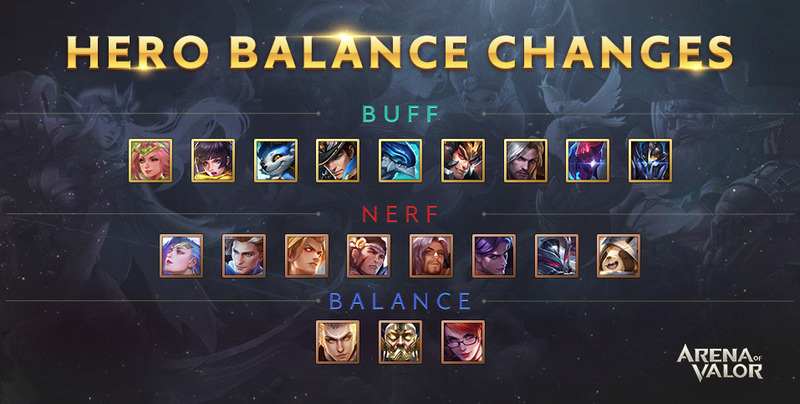 A new update for Arena of Valor is rolling out, which includes changes to hero balance, qualifiers and battlefield, among others. We hope this update will make battles even more balanced and exciting, giving everybody a better experience. 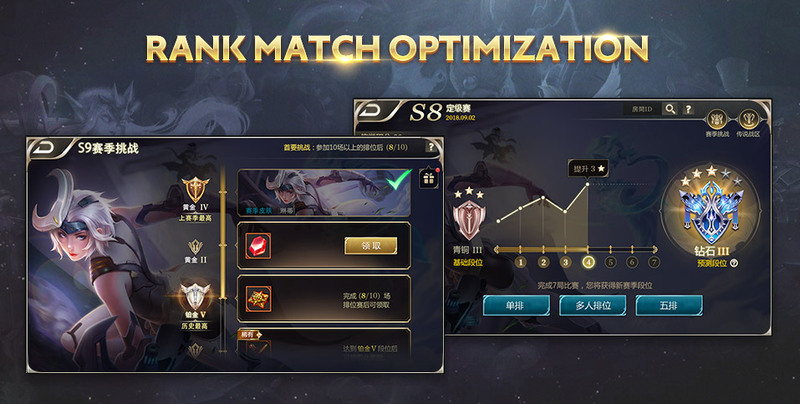 Added new Placement Matches at the start of each season where tiers can be improved rapidly, allowing players to quickly reach a tier appropriate to their ability. Season Rewards have been changed to Season Challenges. Reach a certain tier during a season and receive its corresponding reward when a new season begins. The Favorites page can now show detailed statistics on the heroes you have used. More quick chat messages makes communicating on the battlefield even easier. Three report items have been added and players can now report up to three items, receiving direct feedback on the Results page. Players with low Credibility Scores will also receive less Brave Points, gold and experience. Additional Block options: Stop annoying message sound effects by muting sound notifications for messages from a player. They will still be displayed on the UI but will not play any sound. Added a requirement where players must reach a certain amount of power to be ranked in Legendary Ranking. Save your settings to the cloud so that you can jump right back into familiar settings after changing your device or reinstalling the game. After ordering an idle teammate o [Remain at Spring] or [Follow Me], you can change your mind at any time depending on the current situation. You can now customize certain skins such as adding bunny ears or make your weapon deadlier-looking, for a look that belongs to you and no one else! [Design Concept]We tweaked the Abyssal Dragon's buffs so that it remains relevant throughout, becoming a key resource that makes heroes more powerful for players to fight over. Get Gold and EXP for the match by killing the Abyssal Dragon. Heroes near the Abyssal Dragon when it is killed receive the new buff [Blood of the Dragon], which lasts for 90s or until they die. [Blood of the Dragon]: 90s duration. Skills and normal attacks deal 180(+15 per level) (+0.4AP) (0.7 additional AD) magic damage over 3s when they hit an enemy. [Design Concept]We increased Dark Slayer's spawn rate in order to increase pushing and game pace in the late game, as well as address the issue of Drake being too weak in the late game. [Design Concept]We wanted the Enraged Abys Drg to be a neutral resource with the ability to break stalemates in the end-game. We have delayed its spawn and extended its buff time to allow it to make a bigger impact. As the Abyssal Dragon and its Enraged variant have different spawn times, we have tweaked their HP and attack to match the game pace and hero strength at different points in the game. [Design Concept]Player's vision range is represented as fog of war on the map, providing a deeper battlefield experience. Players can set the fog to on or off when setting up a match. Core receives Absolute Defense: When Core HP goes below 20%, resurrect all friendly heroes and add a shield equal to 30% of max Core HP, reducing damage taken by 70% for up to 10s. Tweaked Garnak's kill buff. The three layers are now: +20% attack speed, +15% damage reduction and +20% damage dealt. Tweaked the aim indicator so that it matches the actual effective area of the skill. Fixed the aim indicator so that it matches the actual effective area of the skill. 7.Fixed a bug in D’Arcy’s ultimate where an enemy hit by the ultimate cannot be pulled back normally.